Ever wish you could go back in time? Back to the days when everything was simpler? When there wasn't over 1,000 TV channels that you had to decide between, when you didn't have to worry about losing your phone because it was back home securely attached to your kitchen wall, and when social media didn't have so much control over your life? Well, back in the 50's you didn't have to worry about becoming Facebook Official with your sweetheart it was much simpler, he would just give you his class ring and once you threw it on a necklace and wore it around at school everyone knew that you two were exclusive. 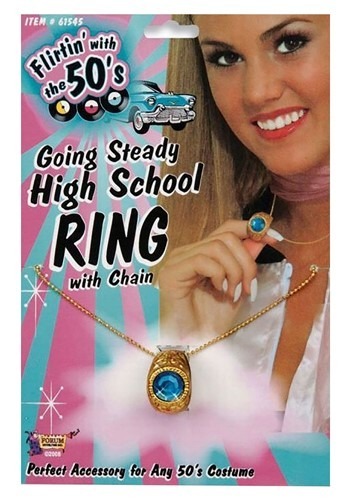 Why not bring back the good ole days with this Ladies Steady Class Ring Necklace? Make others wish their lives were simpler, and then remind them that they to take the leap back to the 1950's with you this Halloween!